iPhone Bags 92% of Smartphone Profits, Sells 14% of World’s Smartphones | Network Directions, Inc.
Steve Jobs, the late co-founder of Apple, indicated that when he started the company, he would have been happy selling a mere 1 percent of the world’s mobile phones. As Apple creeps up in popularity and now dominates 14 percent of the smartphone industry, the company is thriving more fiercely than Jobs could have ever imagined. In the early days, Jobs focused on profit over market share, and this strategy seems to have paid off as the iPhone provides Apple with 92 percent of their operating income and is among the world’s top smartphone makers, even though they only corner a small percentage of the world market. For example, Samsung controls about 25 percent of the market but makes significantly less profit on each device. In contrast to Apple’s figures, Samsung’s phone sales only total 15 percent of their total sales, and -4 percent for Microsoft. A report conducted by Canaccord Genuity tracked several years of activity in the mobile industry. The numbers are based solely on the sales of phones, and the report does not include sales through the App Store or iTunes. Experts at Canaccord Genuity believe that Asian companies, such as Xiaomi, may begin to gain market share. In addition, some Asian companies are also trying to up their long-term profits on not only their smartphone sales, but app and service sales as well. However, China is currently second to North America sales of the iPhone (32 percent), which currently clocks as 22 percent of all phones sold in the country. However small the iPhone’s market share, Canaccord Genuity believes that the larger screen of the iPhone 6 will attract Android loyalists. 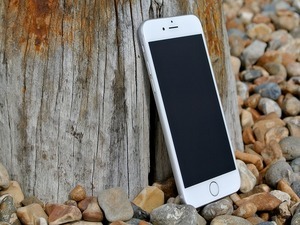 Their survey and report indicates that the larger screen makes the iPhone 6 more attractive, as do the upgraded features and increased power of the phone overall. Time will tell if this trend continues and the iPhone continues to increase both profits and market share.